GrpahVu Disk Space Analyzer is an application for exploring disk directory structure and finding large space-consuming folders and files. GrpahVu Disk Space Analyzer offers outstanding graphical representation of disk directory structure which is different from any other similar tool. Directory structures are presented as directed graphs with folders as nodes. The sizes of folder icons in a graph are proportionate to the sizes of folders they represent and users can clearly see which folders consume more disk space. Nodes are arranged automatically using one of the 3 graph layouts, and users can adjust node positions manually as well. Diagrams can be rotated or flipped horizontally or vertically. Disk scan is quick. Running disk scan can be paused at any time and users can view partial results, change scan priorities, hide folders if necessary then continue the paused scan. Users can free space by moving files and folders to the recycle bin or by deleting them permanently. User can quickly move folders to a new location on the same logical disk by editing graph edges. Users can also search for the files and folders and save results of the search in CSV-files. 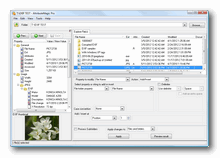 GraphVu Disk Space Analyzer 1.4 is available in 32-bit and 64-bit versions and can be downloaded from http://graphvu.com. It is recommended that you always use the 64-bit version, if you're running a 64-bit version of Windows. Kernel for PDF Split and Merge is the best solution available for managing PDF files in an effective manner. The software allows splitting a large-sized PDF files into smaller ones and combining multiple small-sized PDF files into a single PDF file. UFS Explorer Standard Recovery is a universal data recovery solution. Powerful software mechanisms work with a variety of file systems and storages and allow to handle even complicated cases. Perfect for both home users and IT-professionals. Combine the several word document files by using the Ms Word document merger software with gracefully and flawlessly in one document. This software easily merges multiple docx and doc files in one file. Abonsoft Image Compare can Compare any type and any size images with align points. Images can be zoomed as you wish. Results can be viewed in mask mode or be highlighted with transparent background. All the results can be saved to image files. Utility allows users to view, rename, change file dates and attributes an masse You can set or reset file attributes, change Accessed, Modified and Created dates for the one file or several files in the folder. Includes custom file filters. Opposoft PDF to Excel Converter is an accurate PDF to Excel utility to help you convert PDF files to editable Excel documents. This site does not contain serial number, crack, keygen GraphVu Disk Space Analyzer 32bit serial number : serial number is the simplest type of crack. A serial number(cdkey,product key,etc) is register the program as you may already know. a crack or keygen may contain harmful software. If you cannot find the exact version you want, just give it a try. for more information read .nfo/.txt/.diz file include in zipped file.